“Ethnic minority youngsters seem particularly motivated to establish a career in sport. Primarily, this is likely to be because sport is one of the few spheres which has provided ethnic minorities with a chance of upward social mobility,” said Sine Agergaard and Jan Kahr Sørensen in their book Soccer & Society. Ahmad Hamad was born in Lebanon and moved to Aarhus at the tender age of two. When he was seven, Hamad began playing football, starting his youth career at Aarhus Kfum and hopping across several different teams. He jumped to play for Serie 1 and Jyllandsserien, the fifth best football series in Denmark Tournament, before he realized that further progression would be very hard to come by. He then chose to play the sport as a hobby and committing to Arabisk Kulturforenings Fodboldklub (AKF), a multi-ethnic football club in Brabrand, Aarhus. Hamad has been educated in Denmark throughout his life and is fluent in the language, yet he still feels alienated in the very country he grew up in. He is just as Danish as any other person born in Denmark, although his skin and hair color differ from the norm. Issam Al Achkar, Senior Coach at AKF also laments the country for its lack of ethnic integration in Danish football. “I’m not saying there is any discrimination, but in any country, the son of the country has more chances from others, but of course if they see a lot of a difference in talent between the ethnically-Arab and ethnically-Danish player, in favor of the former, then they will definitely take him. However, if the difference is small, they would choose the latter,” says Al Achkar. This sort of coach mentality takes a toll on the confidence and self-esteem of a player who is ethnically non-Danish. The pressure exerted on such a player would be tremendous, as the need to impress narrow-minded coaches would be top priority, and most players crack under this sort of pressure. “There has to be a huge difference in skill level for them to take the ethnically-Arab,” says Al Achkar. In particular, the players from the “ghetto areas” in Aarhus such as Brabrand and Gellerup, where most ethnic minority groups reside, often arrive to the football clubs relatively late compared to their ethnically Danish teammates, according to Agergaard and Sørensen. Within Soccer & Society, Agergaard and Sørensen interviewed several players of ethnic minority background; with several of them suggesting that discriminatory practice is taking place. “When I think of the contract and such like, it’s as if we Danes with different backgrounds need to be twice as good as the [ethnically Danish] Danes in order to get a contract,” complained Furkan, an ethnically-Turkish player. This reinforces the fact that football skills of ethnic minority players are described in a way that links their physicality with common stereotypes about young males with immigrant background, where they are seen as hotheaded and aggressive. The Danish national football team (DBU) consists of 26 senior players, all of whom are born and raised in Denmark to ethnically Danish parents. Players have complained about the lack of opportunities for them to try for the Danish national team. The under-17 national team contains players of different ethnic backgrounds, however it is extremely hard for them to be promoted to the senior team. National teams in other Scandinavian countries, Norway and Sweden, have ethnic minority players playing at the top level, one who has gone on to win the Swedish Player of the Year seven years consecutively, according to Goal. Sweden’s most famous and best player hails from Bosnian parents and grew up his whole life in Sweden; however, not every country has a Zlatan Ibrahimovic. 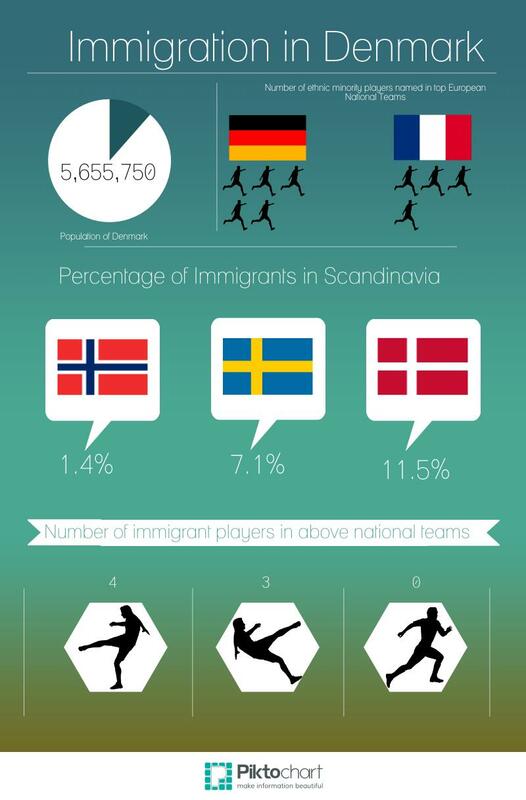 An info graphic comparing the ethnic immigration population to the representation of ethnic minorities within European national teams. Germany and France are known for having the most ethnically diverse national teams, according to a World Policy article in 2014 and an article from Deutsche Wells in 2010. France’s 26-player roster contains three players born outside of France, and several others born in the country to non-French parents, the most impressive being Karim Benzema, who hails from Algerian descent. Germany’s national roster contains five players of ethnically different backgrounds, and all five participate at a first team level. Sami Khedira, Lukas Podolski, and Mesut Ozil are amongst the hottest names in modern football that represent Germany and yet are ethnically non-German. According to the research and investigation done by Agergaard and Sørensen, their findings indicate that club leaders and coaches are reluctant to allocate contracts to ethnic minority talents. They feel that it is too risky and lengthy for them to invest in the development of such players since it involves an investment of time and resources to educate them into Danish club culture. While these ethnically non-danish players are under the same pressure to prove their success as the rest of the team, they are judged on an uneven playing field. Thus, the risk factor of investing in an ethnically Danish player is much lower than that of an ethnically non-Danish player. This is because the latter’s skills have not been accumulated together with an understanding of Danish football playing style, rather they are often self-acquired, and several coaches think it would take too long to change this behavior to make it worthwhile. Also, several of the minority players find it difficult to develop social relationships with teammates, coaches and club leaders who equip them with a supportive social network and an enhanced social status in the field. In fact, the players from the ghetto area tend to feel like outsiders and instead return to their original social networks as Hamad has done. Therefore, the dream of social mobility that drives so many ethnic minority talents, particularly those from low socio-economic conditions is not likely to be fulfilled in Danish football clubs. With light skin, blonde hair, blue eyes and a name so distinctively Danish, Robin Nielsen stands out in contrast amongst his fellow teammates on AKF. Being one of the two ethnically Danish players on the team, it’s easy to assume Nielsen would experience some sense of isolation. However, once the game begins it becomes clear that these are not a group of individuals from various places around the world, but one team that all speak the same language; football. “This has been the greatest experience of my football life. It’s just a lot of nice people; everyone knows each other and takes care of each other. It’s a different vibe and I like it,” says Nielsen. Similar to Hamad, Nielsen started his football career at the ripe age of 12, bouncing between clubs throughout his youth. Even though Nielsen is born and raised Danish, he still experiences parallel feelings of disconnect while playing amongst ethnically Danish players, just like Hamad. While the issue of ethnic integration tends to be directed towards the majority isolating the minority, Nielsen explains how the conformity and systematic playing style of the Danes lacks a sense of community that he has only found when playing with more ethnically non-Danish players. In Agergaard and Sørensen’s book, they explain how ethnic minorities are immediately discounted due to their lack of acclimation to the specific Danish football style from a young age. In an effort to integrate children from different ethnic minorities into Danish football culture at a younger age, the Danish Football Association (DBU) created an extension of their Football Schools project, which is a five-day program where Danish boys and girls aged seven to 14 are coached intensively in various aspects of football. The Integration Football School project, with three consecutive years under its belt, offers football experience to children from different ethnic minorities that don’t have the economic resources to enjoy similar opportunities in the sport as other children. “Our stance is that football should be for all and we try to promote that same framework throughout all of our programs and projects to bring different groups together,” says Mikkel Minor, the Head of customer service relations and public affairs at DBU. “We saw this project’s effectiveness during our work with ACFC, a sports club based in Gellerup. It showed how one week of these resources and trainings could last the whole year for these kids. We saw the club grow from just boys to co-ed and an integration of both ethnic and Danish backgrounds playing together,” Minor says. 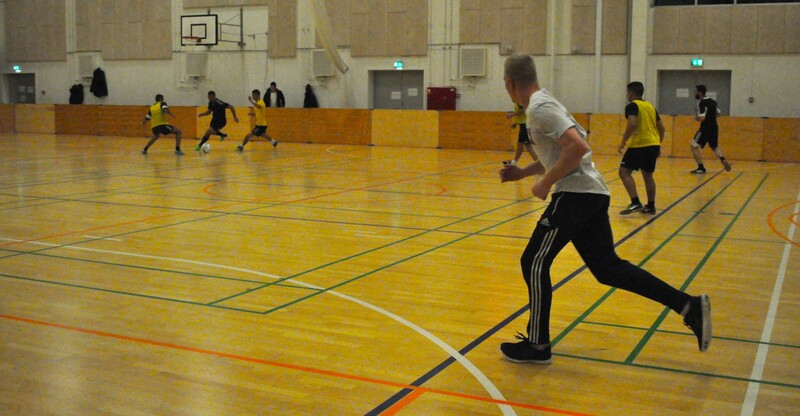 While programs like these show positive efforts to support underfunded minority areas around Denmark by sharing resources and facilities, the focus is short-term and doesn’t extend into the social interaction and inclusion within teams. Even with second-generation minorities, who speak the language and consider themselves immersed in Danish culture, ethnic background still hinders the progress of integration. Close friends, quality football and a thriving club are what keeps Mohammad Halloum involved at AKF and not a more ethnically Danish team. Co-founder of AKF, Halloum sees the issues with ethnic integration among Danish football clubs, but has never personally felt them inhibit his own football career. “Why I play for AKF is because we are a group of friends that started this club six years ago. It’s not that I want to play with my Arab friends, or my Bosnian friends, or my African friends, it’s because this is our neighborhood and local society,” says Halloum. After his family moved to Denmark from Lebanon when he was four, Halloum played with six different clubs, all consisting of mainly ethnically Danish players, except for AKF. While feeling the same level of respect and appreciation across the various clubs he played with, the sense of community and familiarity and equal love for the game is what makes AKF home for him and many of the returning players. Unfortunately, clubs that are based off the types of morals that AKF represent are continuously misrepresented within media, purely based off ethnicity. The Den Korte Avis, an extreme right-wing driven publication that tends to focus on immigrants within Denmark, released an unsolicited article in October tying players from AKF to the ISIS group without any grounds for accusation. The team backed out of an interview after learning that the majority of The Den Korte Avis’ stories centered on criticism towards immigration, which is exactly what the publication based their article about AKF around. As a team sport, football is designed to be an open and equal outlet for players from every background to engage in. The stereotypes mentioned in Agergaard and Sørensen’s book continue to be apparent throughout the selection process within Danish football teams, as well as distance the progress of strengthening diverse communities. With the flow of language and speed of ball connecting these football players on AKF, ethnic backgrounds become a trivial aspect to the game. In this small suburban team in lesser-known Denmark, Danes and ethnically non-Danish football players prove that skin-color is no barrier. Although at such a small scale, it is hard to see integration spreading throughout the sporting culture of the Scandinavian state. This entry was posted in Uncategorized on December 12, 2014 by jmiddle.